As Microsoft revealed that the company sold 4 million upgrades to its new Windows 8 operating system in its first four days, CEO Steve Ballmer dismissed Apple as a "low-volume player" in markets like PCs and smartphones. 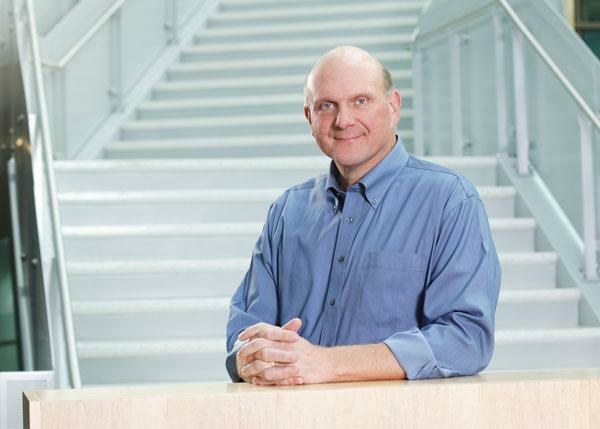 Ballmer was asked in an interview with The Wall Street Journal whether he would prefer Microsoft evolve to Apple's business model, where the company controls both the hardware and software. The chief executive said he prefers Microsoft's business model, though he conceded that it is "evolving" with devices like the new Surface tablet. "In every category Apple competes, it's the low-volume player, except in tablets," Ballmer said. "In the PC market, obviously the advantage of diversity has mattered since 90-something percent of PCs that get sold are Windows PCs. We'll see what winds up mattering in tablets." In the U.S., Apple's iPhone accounts for about a third of all smartphones in use, while Google's Android platform is on more than 50 percent of handsets. Microsoft's mobile platforms accounted for just 3.6 percent of smartphone subscribers, as tracked by comScore in September. As for the Mac, Apple has seen its share of the PC market continually increase as it has repeatedly outgrown the PC market. The latest data issued earlier this month by Gartner gave Apple nearly 14 percent of the U.S. PC market. Microsoft hopes to counter some of the success Apple's Mac platform has had with its new Windows 8 operating system, which became available last week. Ballmer revealed at Microsoft's Build event on Tuesday that sales of Windows 8 upgrades had reached 4 million in the first four days. As for the iPad, as Ballmer noted, Apple carries the lion's share of the tablet market. The latest figures show that the iPad accounts for more than 60 percent of all tablets sold worldwide.